Sorry that I've almost missed today's post. We've had visitors over the holidays and I'm a bit off schedule. Since it is nearing the end of the day, I will post today and tomorrow's entry in one post. 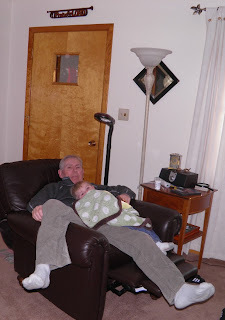 A hundred thirteen years after Lennie was sliding down a snowy hill in Wakefield, Nebraska, his grandson Jim holds in his lap Lennie's great-great-great grandson Marcus, hoping the little fellow will take a nap. Lew is Lennie's friend, Lew Walden, who had recently moved to Phoenix, Arizona. Census data shows the Walden family lived probably within two houses of Lennie's house. Lew must have been a good friend because Lennie mentions him many times. Somewhere I have a photo postcard with a fellow in a ten-gallon hat astride a white horse. I suspect that is Lew or possibly his brother. If I could find it, I'd post it, but I can't, so you'll have to use your imagination about Lew. Lew later moved back east, to Ohio. where he worked as a telegraph operator for the railroad. He died at age 47 at his home in Cincinnati. P.S. Whenever I include a word with a question mark, it's because the penciled word is not legible. Even with a magnifying glass I've had to guess as to the spelling of the word. Do you have a picture of Lennie at Jim's age? It would be interesting to compare a picture of the two of them side by side, or to contrast some of Jim's childhood pictures w/ Lennie's. I've always been aware of how God has formed us and our stories to fit up against and into the lives of others. But your new blog is a vivid reminder that God was at work weaving lives together even before some of those lives were being lived. Oh. I should never try to talk about time. I never make sense. Lennie never made it to my age. He died in 1946 at age 65. He was slightly heavier than me but we did look a lot alike. As you will notice we both have protruding ears. "Better to hear you with, my dear"! I like to think that we were similar in our character.